Tanglewood veteran and 2016 Koussevitsky Scholar Charles Dutoit began Friday evening’s program with the overture to Mozart’s The Marriage of Figaro. I’m a sucker for Figaro, though perhaps not to the extent of some writer who called it the supreme achievement of human civilization. Dutoit’s spirited reading served as a welcome corrective to a bad experience I had with a Figaro conducted by James Levine at the Metropolitan Opera House. Since that great conductor’s legacy is in no danger from the likes of me, I can use my bad experience to make a musical point I believe to be of general interest. In 1999, Levine led the Met company through the most glorious Figaro I ever heard, with Bryn Terfel, Cecilia Bartoli, Renée Fleming (aided by the brief, charming, and fully production-integrated appearance of her then young daughter), Susan Menzer, and a startling realization of the Count by Met stalwart Dwayne Croft. A few years later Levine had apparently agreed with the proposal of famous stage director Sir Richard Eyre—who had little previous experience in opera—to do Figaro as an 18th-century romantic comedy, with Mozart’s contributions tinkling away in the background. The spectacle of great singers singing in a subdued way, while also trying to ham up stage business for which they had neither natural nor developed skill was painful throughout. Figaro has not been in continuous production somewhere in the world since Mozart brought it into being because it is an 18th-century romantic comedy. Levine went badly wrong when he subordinated his great talent to Eyre’s opera-insensitive words-first initiative, however much credit is due him for an inner drive to try something new. Tonight, at least for me, Charles Dutoit set things right again. In Mozart’s Piano Concerto No. 23 in A Major, K. 488, keyboard icon Menahem Pressler felt underpowered relative to the orchestra most of the time despite Dutoit’s strenuous effort to achieve balance. If at times, in the quieter, slower passages, occasional tentativeness, along with apparent lack of consistent agreement between soloist and conductor about exactly where a beat should be seemed to prevail, those impressions might be traceable to my insensitivity to the subtler nuances of interplay between two great artists. Following a standing ovation that he deserved as richly as any great musician who ever received one, Pressler settled himself once again, this time able to set his own dynamic registers. The sheer magic of his virtuosity in Chopin’s C-sharp Minor Nocturne empowered us to face whatever challenges life may bring us. Was that Chopin’s ghost leaning over to me and saying Was I that good? Wagner wrote a famous and highly derogatory piece about Rossini’s Stabat Mater when it was first performed in 1842. Under cover of a pseudonym, the then young German composer attacked it as a product of popular modishness due to degenerate Italianate taste, and money crassly generated both by Rossini’s spectacular commercial success (from 38 operas before he was 40) and lawsuits concerning the complicated composing history that resulted in the final Stabat Mater. For years, I bought the standard music program between-the-ads-and-appeals-for-donation opinion that Wagner was a major genius and Rossini a minor one, with the soul of a hack, because he quit composing at his peak and spent his next three decades enjoying life before bestowing his “Sins of Old Age” upon us. Now, I think the young Wagner wrote that anti-Rossini diatribe because he was just plain scared that he would never be able to realize in music the idea of suffering as expiation necessary for sublime aspiration as thoroughly as Rossini did in Stabat Mater. I’m pretty sure that such considerations never crossed Rossini’s mind. Early in life, he discovered how to use for personal advantage an inborn skill acquired as all skills are by random gene mixing due to equally random choices made by his parents, and he ran with it. His unprecedented and not yet exceeded success at doing that is just as accidental, but who cares? Charles Dutoit then led 200+ highly talented instrumentalists and singers in a dramatic re-demonstration of musical creativity so extraordinary that it will be celebrated long after our own startled exaltation has died down, and even that will take a lot of time. The choral work that opens the masterpiece (Stabat mater dolorosa) immediately established the high standard that was to prevail throughout the performance. 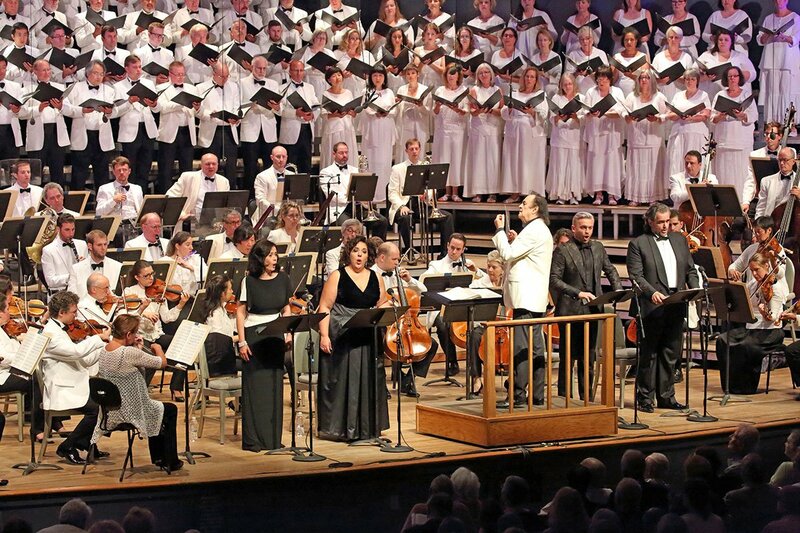 Prepared by guest chorus director James Burton, the Tanglewood Festival Chorus once again displayed the smooth voice blending and comfortable control over a wide dynamic range that Boston audiences came to expect from them during the long tenure of founding director John Oliver. In the first solo section (Cujus animam), Slovakian tenor Pavol Breslik quickly served notice that the standard set by the opening chorus was to be maintained. Hearing any tenor for the first time is always a little suspenseful, because quality variations in that voice range are somewhat greater than in the others, even among world-class performers. In his first few bars, Breslik’s solid tone and confident technique assured us that all was going to be well, including the exposed high note near the end, and it was. The third section (Qui est homo) introduced the female soloists, both of whom have superb voices, but also skill at using them together that is not in the technique ensemble of all singers otherwise able to perform at the highest level. Soprano Simone Saturová, also from Slovakia – which on the evidence of this program has discovered some special formula for incubating vocal talent, has a clean, clear, steady tone made to appear effortless by a level of vocal technique that surely was not acquired effortlessly. Sicilian mezzo-soprano Marianna Pizzolato’s tone was equally clear and steady, but round, full, and warm – the angelic mezzo tone rather than the smoky kind so effective in other parts of the vocal repertory. Their passages together were a pure delight. Italian bass Riccardo Zanellato nearly walked away with the evening. His deep, rich sound is inherently capable of such menace independently of word meaning that his Faust-tempting Mephistopheles and murderer-for-hire Sparafucile in Rigoletto must have frightened any children whose parents allowed them to be in the audience for works of that nature. Yet he had turned that menacing quality entirely off for this work’s Pro peccatis – one just knew it was there, available to him any time he wanted it. No other single effect in singing quite matches that of sensing massive resources still in reserve while a great vocal artist fully realizes the expressive potential of a specific passage. Jessie Norman singing gospel is one kind of example. Zanellato’s tender evocation of Mary’s sorrow at the foot of the Cross in the work Tanglewood heard tonight was a supreme one. Composer! Composer!! He’s dead? Well then go out and find more like him! James Prichard, a Yale physician and scientist, occasionally pinch-hits as a music critic. Wow! Room for more than 6000 people in more or less comfortable seats under a roof secure against rain if not heat and humidity, but no walls to make reflected sound do funny things. Plus a lawn able to accommodate at least 10,000 more, seated or lying on grass in whatever ways they can manage, while hearing events from the stage over a sound system so technically refined that you don’t realize it’s there. thank you for your brilliant description of the event, Mr. Prichard !!!!! !…..almost sounded as if we’d been there !! Fond memories of working at Tanglewood for 4 summers are conjured up by your piece. Also, love the headline pun!! Dr. Prichard, thank you for your perceptive review of a fine performance. With regard to the Marriage of Figaro cast, assume you meant Susanne Mentzer, who sang Cherubino. My thanks for Ms Kingsford for correcting my poor recollection of Susanne Mentzer’s name. A small point: the seating capacity inside the Shed was 6,000 in the Dr. Prichard’s intern years, but it’s now about 5,000—in larger and more comfortable wooden chairs. The prior seats were metal and rather spartan.